There's something so comforting about apples. Some people prefer to eat them cooked, others can't wait to bite into a crisp apple plucked from the tree in the fall. But there are few people who would turn down the opportunity to enjoy apples at an apple themed dinner party. The menu below is designed for one host to prepare for a group of dinner guests. Create an apple basket centerpiece. 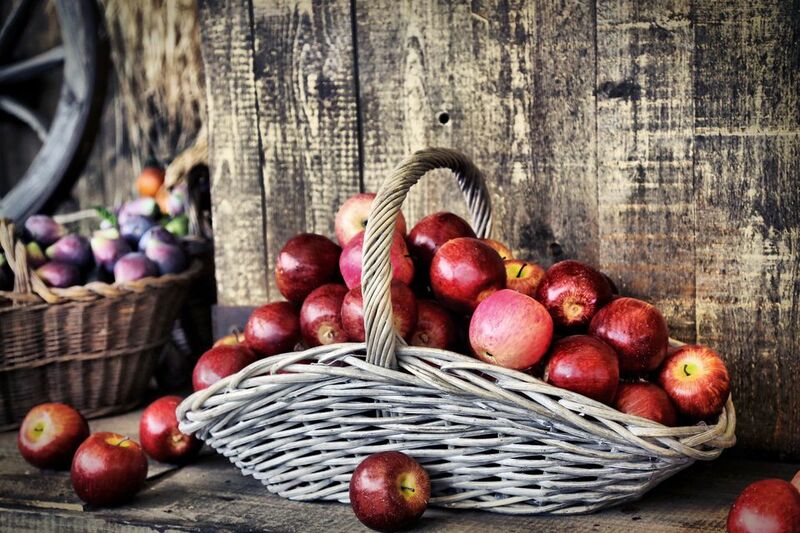 Fill clear bowls or small baskets with apples and arrange them in a row down the center of your table. Cover your table with butcher or kraft paper and decorate it prior to your party using a cut apple as a stencil. Make apple cups to serve drinks, snacks, or even savory side dishes. Purchase a table cloth with an apple design to cover your table. Pull out any apple dish towels and pot holders you have (everyone has a few hiding somewhere) to use in the kitchen throughout your party. Use small apples with stems as place card holders. For each guest, write their name on a small, rectangular piece of white card stock with a red or gold pen. Punch a hole in the upper left corner, and use kitchen twine to tie it onto the apple stem. Put one in the middle of each plate. Apple Sour Cocktails - Kick off your party with an apple cocktail. This version is less sour than the classic sour apple martini. Brie and Apple Appetizers - Make sure your guests don't eat so many of these addictive appetizers that they lose their appetites for the rest of the meal! Acorn Squash and Apple Soup - Cooked apples don't always have to turn into a calorie decadent apple pie. This low fat dish will give a savory start to your meal. Roast Loin of Pork with Stuffing - This elegant entree uses fresh apples and dried fruit in a savory stuffing. Apple Risotto - Alternatively, you can serve this warm Italian side dish that is the essence of comfort food. Dutch Apple Pie - An apple theme dinner party wouldn't be complete without an apple pie, so you may as well try the recipe that makes the Dutch proud. Spiced Baked Apples - This comforting recipe will bring back childhood memories. Polish Smoked Sausage and Sauerkraut - This make ahead dish is perfect for large gatherings. Gluten and Dairy Free Apple Zucchini Spice Bread Recipe - It's always thoughtful to add recipes for guests with special dietary requirements.